Generac has resolved the issues that once made standby power impractical. Back up industrial generators are now entirely possible and can generate immediate power when utility power fails. Keep perishables fresh, protect against data loss, maintain theft prevention systems, keep all emergency systems running without pause with Industrial generators. 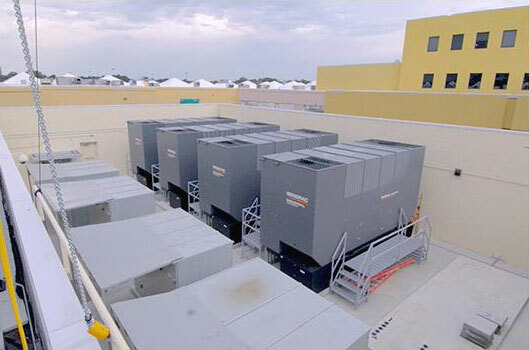 For more information commercial generators, contact South Shore Generator in Wareham, MA. Kohler power generator systems has a solution for every aspect of your backup power and critical load requirements. We offer EPA certified generators for 10 to 3250 KW, a full line of automatic transfer switches with ratings to 4000 AMPs, plus customizable parallelling switchgear and controls. Kohler is trusted around the globe providing power to hospitals and clinics, safeguarding travelers, maintaining productivity, presering data, and ensuring safety. For more information on reliable Kohler power systems, contact South Shore Generator in Wareham, MA. Portable generators come in a variety of flavors, from camping-sized 1800-watt models to 10,000-watt monsters that power an entire job site. The 5000-watt power class works well for powering just about anything on the job site, and it can power most of your larger household appliances. While there are a ton of options in this wattage class, it’s tough to beat diesel. There aren’t a whole lot of portable options in that vein, but one that I like is the Generac XD5000E diesel generator. The word “sturdy” might not quite do the Generac XD5000E justice. At 252 lbs, you’ll likely plant this generator where you need it and avoid moving it again if possible. That or just get your apprentice to move it when the need arises. You expect a heavier weight with any diesel engine and there’s a reason for it. How many small consumer diesels do you see running around? Not many. Diesel engines are built to run long and strong. Even smaller diesel engines are known for their long life and excellent fuel efficiency. That brings up the immediate question of, “why does this $3700, 250-lb generator not come with handles and wheels?” It’s a fair question. Regardless of the answer, if you’re using this generator for portable uses, spend the extra $150 on the wheel kit. Likewise, the Generac XD5000E features an electric start. It’s a no-brainer to avoid the hassle of pull starting this beast every day. One other thing about diesel as a fuel source – there’s no carburetor to maintain. There are still plenty of ways a lack of maintenance will get you, but a carburetor is a headache you won’t have to deal with. The Generac XD5000E, as previously mentioned, offers both electric start-up as well as recoil backup. Of course, you can only use the electric start-up feature if you’ve purchased a battery, but the feature is there. As with all generator batteries, you’ll need to connect it and charge it before its first use. This generator also features a fuel primer bulb and a compression release lever. The bulb helps to restart the generator after you’ve run it dry, and the compression release lever makes start-up a good deal easier in colder temperatures. 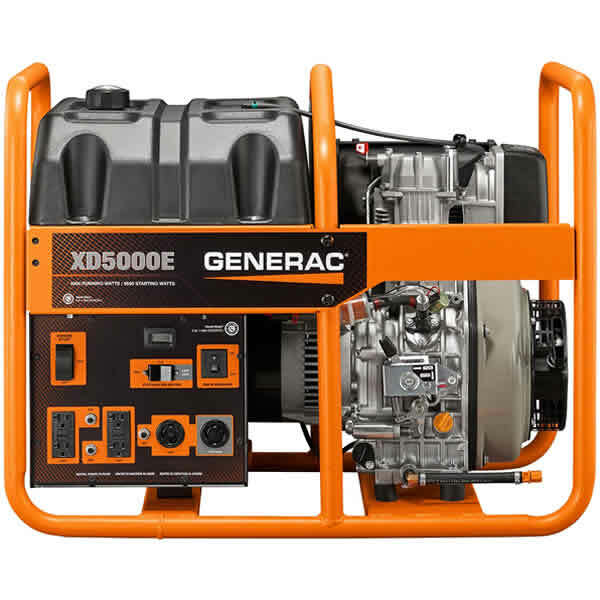 The Generac XD5000E runs on diesel fuel, which points to the fact that Generac designed this generator to run long and run often – this is a heavy-duty machine. It features a Yanmar LW Series, 435cc air-cooled, direct injection industrial engine. This generator pumps out 5000 running watts and 5500 peak starting watts. This amount of power will adequately run multiple power tools on the job site, including your 15-amp table and miter saws. This is a common class for job site crews that is a near-perfect combination of power and fuel efficiency. This system runs at less than 6% total harmonic distortion as well. If that sentence sounds like a bunch of science-y, engineer-speak, basically, this means that your electronics will run more smoothly as the generator isn’t pumping out big power spikes. The Generac XD5000E really shines in the runtime category. Where a lot of the generators we looked at crank out a piddly 6-9 hours of runtime, the Generac runs for an impressive 32 hours at 50% load. Granted, the XD5000E has a 12-gallon tank, which is a bigger tank than most. Per gallon, the XD5000E gets the outstanding fuel economy. This owes a lot to its running off of diesel fuel. The Generac XD5000E makes a pretty compelling case for going diesel if you’re not all that interested in refueling every 6 hours. If you’re looking for a generator that can tackle long days and heavy usage, you’ll do well to consider the Generac XD5000E diesel generator. Its diesel engine means business, and it has enough of the right kind out outlets to power the vast majority of what you’ll throw at it on the job site. As long as 5000 watts meets your needs, there isn’t much to complain about with this model – just be sure to order the wheel kit and battery! 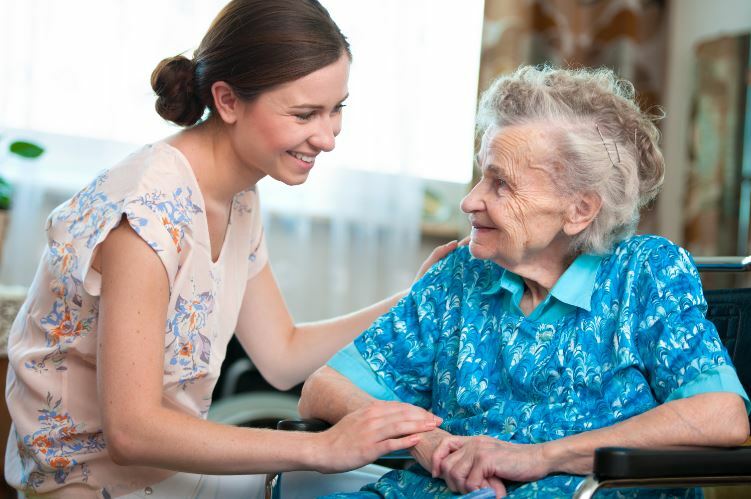 For more information, contact South Shore Generator in Wareham, MA.